“ONE & DONE” = One Treatment Done in One Day! 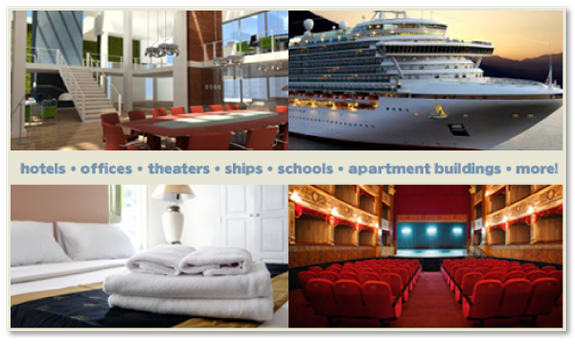 Bed Bugs in NJ or NYC Commercial Buildings, Hotels, Apartment Buildings, Theaters and much more! 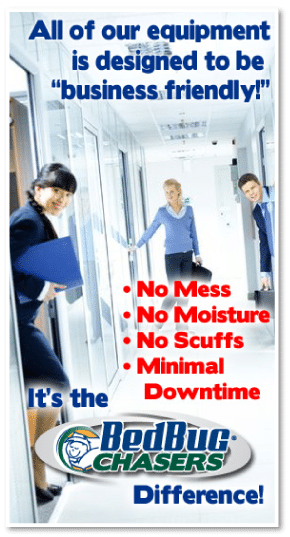 There are several companies that advertise they can treat and Get Rid of Bed Bugs NJ in “Commercial, Multi-Unit & High Rise Buildings” with heat, but it takes more than words to successfully treat office buildings, apartments, hotel rooms or dormitories safely and efficiently without the need for follow up bed bug treatments. Not Sure if You Have Bed Bugs? BedBug Chasers now has K9 Bed Bug Dog Inspection Services! At BedBug Chasers, our warehouses of heaters, miles of cable and fleet of generators enable us to complete any size project for same day bed bug removal . When you choose BedBug Chasers for your Commercial & Multi-Unit Bed Bug Removal projects, WE GET RID OF BED BUGS NJ and we arrive with an unmarked tractor trailer full of the industry’s most powerful heaters and enough generator capacity to run every piece of equipment simultaneously and can complete One Day or Overnight bed bug removal. The key to effectively treating commercial properties and multi-unit dwellings is to complete the treatment as quickly as possible without sacrificing quality or compromising the process. Our One Day Bed Bug Removal can be performed Overnight keeping your business disruption costs down, minimizing business interruption and preventing bed bugs from returning to previously “treated” areas. Overnight Bed Bug Removal is the ultimate in discretion and brand protection; we arrive after closing and treat through the night wrapping everything up before the morning sun. BedBug Chasers is also available on weekends to work around the clock from Friday night till early Monday morning if the need arises. “ONE & DONE” Bed Bug Removal Services for Commercial & Multi-Unit Buildings it’s How to Get Rid of Bed Bugs NJ! Don’t be fooled by false claims. Most companies are only capable of heating a few rooms per day. They return the following day to heat a few more rooms, and so on. At that rate, it could take a week or longer to treat the entire area. The disruption to your business, loss in confidence and damage to your brand is immeasurable remember only BedBug Chasers can offer large scale Same Day, One Day and Overnight Bed Bug Removal. Bed Bug Heat Treatment for Commercial, Multi-Unit and High Rises We Know How to Get Rid of Bed Bugs NJ! Our Competitions slow “room by room” method also allows the bed bugs to migrate back into already treated rooms. If you have a multi-unit dwelling, bed bugs are likely to be in more than one room, and perhaps more than one unit. They infest walls and travel between rooms via ducts, pipes and other conduit lines within the building. Bed bugs are always looking for their next meal. If they are given the chance to escape, they will return to rooms that were just treated and look for fresh blood. Success in treating large properties and multi-unit dwellings is only accomplished by bringing enough equipment to do the job right the first time. BedBug Chasers will heat and treat your entire building safely, efficiently and effectively.